Are the seasons shifting? Only asking because over this spring weekend, it was a whopping 30 degrees F in Chicago. We’ve been stuck in a cold streak that feels colder than our December. So what’s a girl to do when she can’t enjoy a nice spring walk outside? 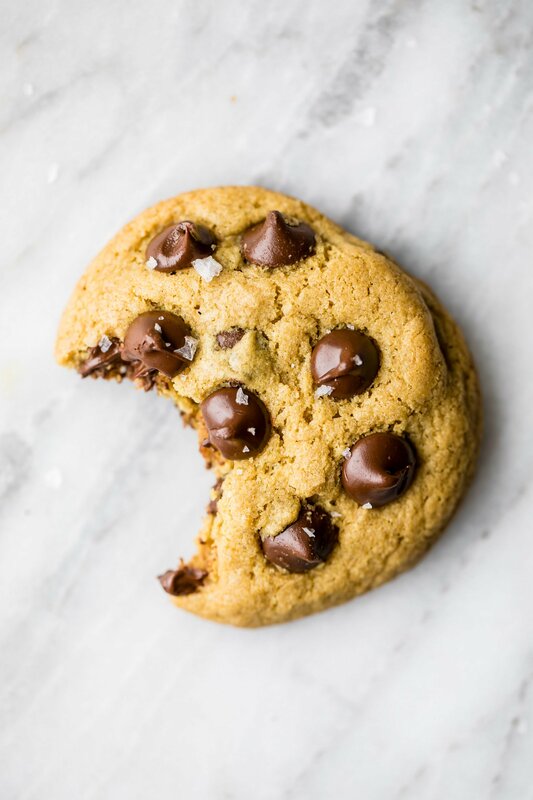 Bake the BEST gluten free chocolate chip cookies on the planet. Obviously. Some of you may remember this recipe from back in 2014 when quinoa was just as trendy as matcha lattes, turmeric and almond flour are now. I’m reposting it now with just a few tweaks. And, even though quinoa flour isn’t as popular as it used to be, these cookies still deserve to be baked because they ARE HONESTLY SOME OF THE BEST COOKIES YOU WILL EVER EAT. FYI: sometimes caps necessary to get my point across. Seriously, these are some outrageously delicious, ooey-gooey, mind-blowing gluten free chocolate chip cookies. I first came up with this recipe by just experimenting also known as the ‘buy a bag of crazy flour and see what you can make’ kind of recipe. Luckily for me (and you!) it worked out like magic. TOLLHOUSE I’m coming for you. 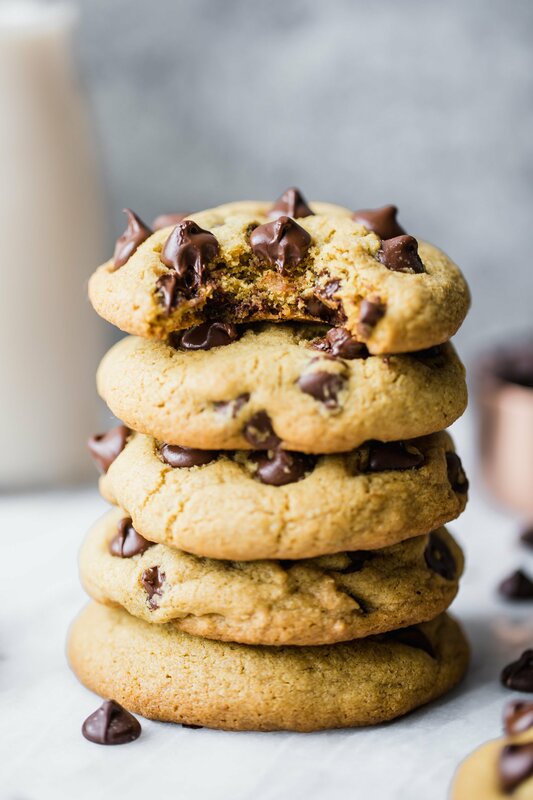 These chocolate chip cookies are perfectly crispy on the outside, but ooey-gooey in the middle. They stayed soft for days and they had this SLIGHT unique flavor from the quinoa that I absolutely LOVED. I really think that this is one of the best gluten free chocolate chip cookies EVER. But obviously I’m a little biased. That’s why I need you to make them and report back. Quinoa Flour: I used quinoa flour which is naturally gluten free. It’s also high in protein and similar to bread flour in the fact that it will make your cookies extra chewy and soft. You can ususally find quinoa flour at Whole Foods and some specialty grocery stores. I like the Bob’s Red Mill brand best. Baking soda: Make sure it’s fresh! I’m serious. If you’re baking soda is more than a few months old, toss it. Melted Coconut oil: I used virgin coconut oil in this recipe which gives these a subtle coconut flavor, although you can used grapeseed oil, regular butter or melted vegan butter instead. Eggs: I like to use a large egg for rich flavor and texture, but I’m fairly certain a flax egg would work well in this recipe if you want to make these vegan-friendly! Vanilla: Some people consider vanilla to not be gluten-free as it contains alcohol. My recommendation is to buy alcohol-free vanilla if you’re worried and truly want to make these gluten-free. Or just skip the vanilla and add a splash of fresh coffee. Dark Brown Sugar OR Coconut Sugar: You know I don’t mess around with light brown sugar. Dark brown sugar is truly that much better at creating a flavorful cookie. It has a higher ratio of molasses and so you get a cookie that’s a bit richer, but light brown sugar will work. I also am giving you the option to use coconut sugar, an unrefined sweetener. Personally I like the brown sugar a bit better. Chocolate: Here’s where you get to be creative. 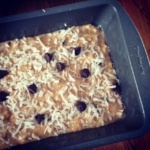 You can use your favor chocolate bar and chop it into chunks, or just grab of your favorite chocolate chips. If you’re vegan or dairy free, use dairy free chocolate chips. Sea salt: Don’t you dare forget that sprinkle! Well, I guess you can if you want. I don’t want to be too bossy. But again, these cookies are pretty damn fantastic when they’re a little sweet and salty. I hope you love these cookies and make them soon. We all loved them here and COULD NOT believe how amazing they tasted. Enjoy! xo. If you make this recipe, be sure to leave a comment and rate the recipe below. You can also snap a photo and upload it to Instagram with the hashtag #ambitiouskitchen. 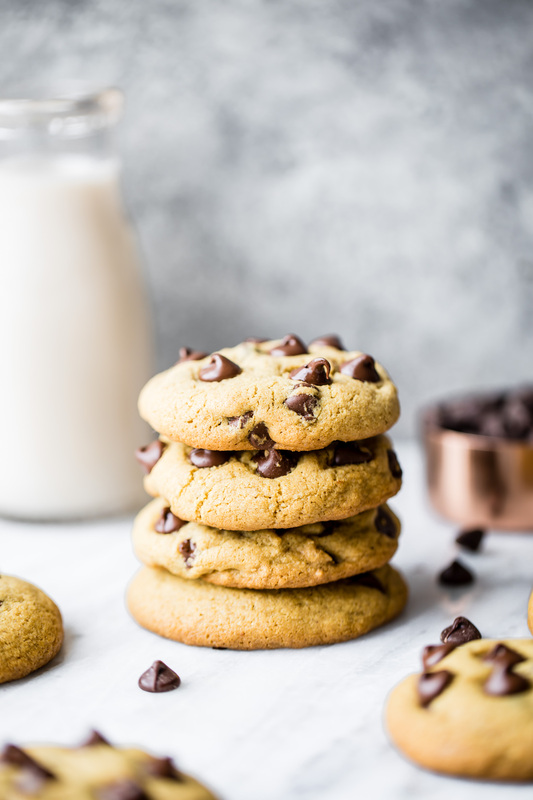 This is the BEST gluten free chocolate chip cookie recipe you'll ever eat! 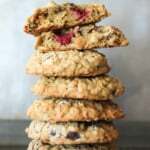 Made with quinoa flour and coconut oil, this cookie will surprise you with flavor and texture. Easy to make and best of all, you'd never know they're gluten-free or made without butter! In large bowl whisk together quinoa flour, baking soda, and salt; set aside. In a separate bowl, mix together melted and cooled coconut oil and brown sugar until smooth. Add in egg and vanilla and beat again until smooth and creamy. Add in dry ingredients and mix together until combined and a dough forms. Fold in chocolate chips. Roll dough into 1 inch balls and place on cookie sheet leaving 2 inches apart; if you want flatter cookies, gently push down the dough with your hand to flatten the tops a bit. Bake 8-11 minutes or until edges just being to turn a golden brown. Do not over bake; we don’t want crispy cookies here! If you noticed that your cookies are baking flat, then you may want to chill your dough for 10-20 minutes. Remove from oven and let cool at least 5 minutes on baking sheet. The cookies will need to set and will be very fragile at first so you have to be a little patient for the edges to harden a bit before removing them. Once the edges and bottom harden a bit, transfer to wire rack to finish cooling. Makes 24 cookies, feel free to double the recipe if you want more. 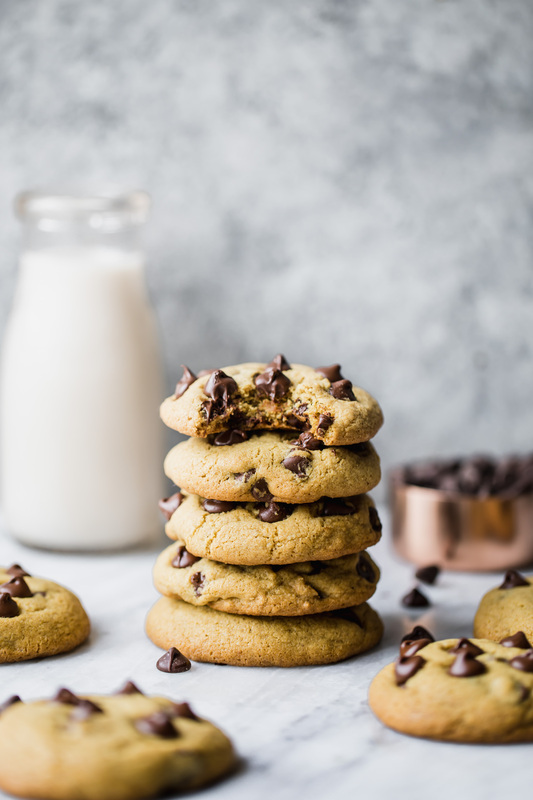 168 Responses to "The Best Gluten Free Chocolate Chip Cookies You’ll Ever Eat"
A fellow mom from our homeschool group is always looking for gluten free recipes due to her Celiac. I will have to pass this along to her. They look just heavenly. Thanks for sharing!! I’m sure you’ll be even more creative working hire. Is there a way you could list the nutrition info? I have made my own quinoa flour. I toast it in a dry pot with a lid. They will pop like popcorn. Add the quinoa to the pot before putting it on the heat. I let I cool and then I in it through my Ninja. Do it in small bursts because it will heat the blades. Yes, I replaced mine with rice flour, it really works just as well(if not better).????????? 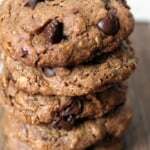 Is using flax seeds a common binder for vegN cookies? I don’t know if it will work as I haven’t personally tired it, but I have a Paleo recipe that calls for a “chia egg” which is one tablespoon ground chia seed mixed with 3 tablespoons water. Let sit for 10-15 minutes, or until gooey like an egg, and incorporate into your recipe. I will try this soon, just haven’t yet. Reminds me of that book about the hen who made her own flour and throughout the whole process no one helped her – so they didn't get any cookies (or bread). OMG I HAVE GOT TO TRY THIS! Gah!! These cookies sound so delicious!! Love the quinoa in there! I love any gluten-free recipe that requires just ONE kind of flour. Flour blends are fun and all, but…wait, flour blends aren’t fun. 😉 Anyway, even setting that aside, these cookies look awesome. 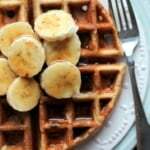 Thanks for sharing this must-try recipe. i have to make these. i’ve been wanting to use quinoa flour because i have some. yum! What, if any, other oil could you use in this recipe? I absolutely detest the flavor of coconut! Oh these are yummy!! I did make a few changes…used flax/chia egg, used 1 cup coconut sugar & 1/4 applesauce for sweetener, half coconut oil & half butter for fat (no coconut taste at all, my coconut oil is not refined so it has flavor but couldn't taste it in the cookies).Also only used half a cup of chocolate chips, still very sweet. You can taste the quinoa in these, which I like, but some people don't. You can use buckwheat or half buckwheat (or whatever gluten free grains you have on hand) and half quinoa. Very good recipe! P.S. I grind all my flours fresh…which also makes it tastes yummy! Just ate my 3rd one right out of the oven. These are fantastic. Hubby loves these. I didn't have quinoa flour but only had 1 cup of quinoa. I actually browned the quinoa for a few minutes. After cooling I added 1 cup of oatmeal. Then ground both of them together in my Ninja to make a flour. I had 2 cups. I kept to the recipe on the rest. 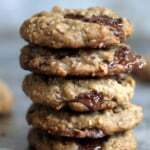 The coconut oil and the nutty flavor of the browned quinoa made this cookie scrumptious. Will be making these often. 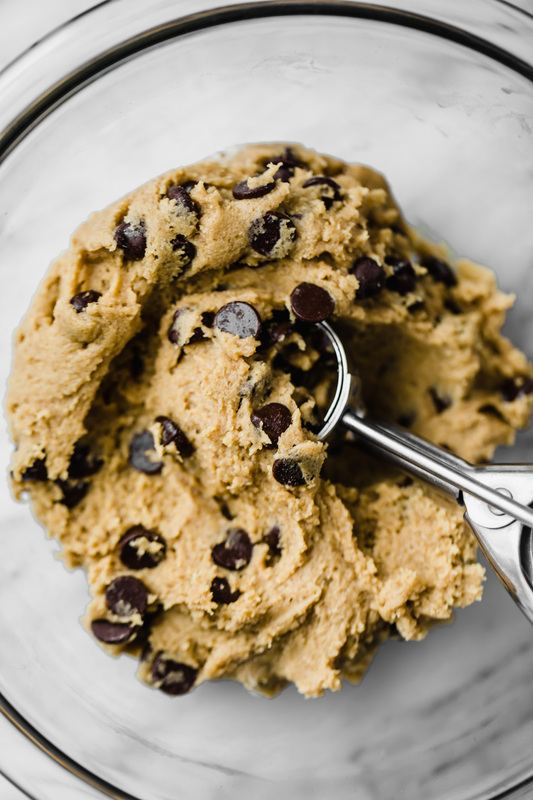 Oh yes, I actually use a tablespoon measuring spoon to get the cookie dough and scoop on the baking sheet. This makes my cookies all the same size. Yum yum yum! I would have hated the thought of using coconut oil in a cookie until recently, I had one too many bad coconut oil experiences but I finally found one I love (Loving Earth for the Aussies here) Do you think I can sub natural cane sugar/rapadura/muscavado sugar for the dark brown sugar? Yes, I think you can sub muscavado sugar or coconut sugar. Oh My! You cookies look awesome, and using quinoa flower just puts them over the top! Ok, First of all I LOVE your blog & recipes are sssooo great and of course nutella-chip cookies are a hit. Could you make your own quinoa flour by milling it yourself? I have quinoa, but not quinoa flour. I’ve never tried it, but I’m sure you could! Absolutely! I buy whole, white quinoa and blend it fine in my vitamix. Then, because quinoa has a bitter, grassy flavor, I toast it in the over at 250 F for a couple of hours. The oven will heat up the house and do double duty. Another great looking cookie! Thanks for sharing! Wow! I made these and they are so freaking good. They remind me of that brand “Soft Batch” that was so popular in the 80s, but way better. I’m not even gluten free, and I would take these over so many flour-laden cookies. I’ve been a celiac for over a decade, and I’ve made dozens and dozens of different chocolate chip cookie recipes over that time. This beats them all. Hands down. The texture was perfect, the taste was awesome. Thank you!! That is so wonderful to hear, Heather! I’m glad that you enjoyed them. Thanks for leaving a comment. What is the best substitute for quinoa flour? Can you use half gluten free flour and half ground almonds? I tend to do this with cakes and it is delicious but unsure if it would work with cookies? I cant find quinoa flour anywhere in uk!! please help!! I just made two separate batches. The first was exactly like the recipe and the second was the same EXCEPT I substituted 1 cup gluten free flour and 1 cup almond meal for the 2 cups of quinoa flour. It did NOT work. The first batch looks amazing and tastes great except that some of the kids did not like the quinoa after taste. The second batch was a messy goo! Maybe adding xanthan gum would help? Hi Shelly! I can’t really help you with the second batch, because it sounds like you completely changed the recipe. Next time, you may want to try toasting the quinoa flour first for 5-10 minutes in a skillet over very low heat (stirring frequently). This helps eliminate the quinoa taste you are describing. Hope this helps! I actually changed this recipe byusing 1/2 quinoa and half cup for cup flour. I believe it changed to cooking time a bit so if anyone else does this, I had to add about 6 minutes additional time to the first batch that went in. They were still very soft when they came out of the oven, and hadn't turned that golden brown on the edges yet, so figured it would be ok. They are still cooling on my counter at the moment and we can't wait to try them. Thank you for this recipe. mine did turn out flat but smell delicious! is the refridgeration the only trick? Did you refrigerate them? If not, then yes that probably was the problem. Also, is your baking soda fresh? I made these cookies a few days ago and they were so good! Hubby and kids loved them too. By far the best “healthy” cookie I’ve ever made! I was wondering though, if there was anything you would recommend instead of using all brown sugar? I was thinking maybe honey, but wasn’t sure if that would mess with the texture too much. Maybe coconut sugar? Thanks! Coconut sugar should work. Haha I’m not sure if these would be considered healthy though! My cookies stayed in balls and never flattened out. Anyone else have this problem? What did I do wrong? Did you follow the directions exactly? I’m sorry you had trouble. Did you flatten down the dough a bit? Mine also stayed in balls. After the 10 minute mark, when I saw this, I pulled them out and sort of flattened them with the back of a spoon, then put them back in the oven for another 3-5 minutes. Just took them out and they’re cooling now and seem quite crumbly, but I tasted part of one and it tastes good. I have to admit to using a gluten-free all-purpose flour blend instead of the quinoa flour, so that could be the issue here. That and I refrigerated them for 5 minutes before baking since they were really gooey when I first made the balls. I cannot eat regular chocolate since it inflicts a migraine! Is it possible to use white chocolate instead and also to add in walnuts? And could the coconut oil be replaced using vegetable shortening? Yes you can use white chocolate and walnuts. I am not sure if shortening would work – I haven’t tried it but let me know if you do. I made them for those in my office who are gluten free, and everyone in the office loved them, not just those who were gluten free. Heck, I loved them, as did my very picky boyfriend!! Can I use butter instead of the coconut oil? I am making these for my boss who has a severe gluten allergy but is not a fan of using substitutes for oil/fat ingredients. Wondering if using regular butter would give them a more authentic taste? Thanks! That should work. You may need to increase butter to 3/4 cup. Monique, I’m new to gluten free baking and just tried your recipe tonight. I chilled the dough for 20 minutes then baked. They are absolutely delicious! Thanks so much for the recipe. I’d love to send you a picture. How do I email you? The cookies are delicious! I made them with half almond flour and half quinoa flour, reduced the sugar to 1/2 cup, and used rapadura sugar instead of brown. They came out wonderfully. I made them bite-sized and used EnjoyLife mini chips and my husband positively squealed over how adorable they looked. Tasted great, too. Thanks for the recipe, I will definitely check out more of your posts. Looks great! I’m excited to give this a try. Btw- vanilla/alcohol doesn’t contain gluten. I have celiacs and have done a terrible amount of research. I make my own vanilla with vanilla bean and vodka (which is made from potatoes) and even the varieties that are made from wheat are considered gluten free due to the distillation process. Im interested in substituting the quinoa flour with either coconut flour, or almond flour. Which would you recommend? Hi! First let me say your cookie looks very tempting! Could you suggest if I can use alternatives for sugar (honey/applesauce) and oil (coconut oil or any other from of fat like more egg)? Hi! Is there any replacement for the brown sugar to make then sugar free? Would xylitol work? How are good are these for diabetics seems the sugar content may be high is there an alternative? This cookie is sooooo good!!! i substitute the quinoa for almond flour and used coconut palm sugar. my kids dont even know its not the usual chocolate chip cookies! great recipe, thank you! Not a fan these coolies at all; the choco pieces/chios kept falliout of the dough. Ended up chucking it out the window. I’m sorry you had to chuck your cookie out the window. Sounds like a crime! i made these and subbed Bob’s Red Mill G/F Flour. Wonderful! Happy that you guys had fun in AZ. Wow, not a native; camelback is quite the challenge, I can manage about 1/2 way up to Piestewa peak. I had quinoa flour and need to use it ip, but was just a few tbl spoons shy, so I used less sugar and added a few tbl spoons of agave for moisture.Balls never spread out but I pressed down, I’m sure it was because it is cooler out and I didn’t melt the count oil. I added unsweetened coconut flour. my husband and I loved them. The house smells great! Happy that you guys had fun in AZ. Wow, not a native; camelback is quite the challenge, I can manage about 1/2 way up to Piestewa peak. I had quinoa flour and need to use it ip, but was just a few tbl spoons shy, so I used less sugar and added a few tbl spoons of agave for moisture.Balls never spread out but I pressed down, I’m sure it was because it is cooler out and I didn’t melt the coconutoil. I added unsweetened coconut flour. my husband and I loved them. The house smells great! Made these twice already, once for Christmas, and just now. 🙂 They are so yummy I like them better than regular choc chip cookies. Not that it needs it , but I added a little extra sea salt and use Trader Joe’s vanilla flavoring instead of extract. Mmm. Love. Is that correct , 180 cals. per cookie and 15.4 gms. of sugar per cookie? It seems high. I have made them and they taste great, unique flavour form the quinoa. Just concerned re: high sugar content. Please respond. Thank you. It should be correct. It’s most likely from the chocolate chips and sugar in the cookie dough. If you want less sugar, then reduce the amount of chocolate chips or use a sugar free stevia based chocolate. You usually always pack brown sugar, but I think leveled would work just as fine in this recipe. Just tried these cookies and the dough does not stick together. It’s like powder. I have tried to put the crumbly dough flat on cookie sheet and see if it cooks that way but this recipe did not work for me at all. I did make it with quinoa flour. I make my own flour so it may be that that’s the problem? I just made these and I have to say that I was pleasantly surprised. I was a bit worried about the coconut oil, but these were so delicious and I love the fact that they are butter free! I will make these cookies again. Thanks for the post. Ok, just made these. I did add the 3/4 cup coconut and it made the dough quite dry and crumbly and the dough didn’t spread at all, just stayed in a ball. Perhaps an extra egg and or coconut oil might fix that problem. I also used carob chips instead of chocolate because that’s what I recently purchased to try for this particular type of recipe. 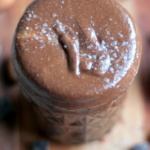 I found that using the coconut sugar it was too sweet and intense. I recommend that anyone using coconut sugar instead of brown to cut back at least 1/4 cup. The flavour was terrific and will be making again with minor adjustments. Thanks for posting and sharing! Hi, they look great. Can the sugar be replaced with stevia? If so, how much? Forgot to leave my star rating! These cookies surprised me with their deliciousness. I used coconut sugar so they were quite dark in color-looked like chocolate cookies. They were VERY oily when I rolled them in my hand; I was concerned that they would spread over the entire cookie sheet but they remained intact! I used a spoon and pushed them down flatter from the ball shape while they were baking..sprinkling w the extra salt is great…I’ve ever used quinoa flour before..yes..an interesting smell to it but the time in the skillet seems to help…I will make these again…I would have to give 5 stars for their goodness and a bit better for us than the traditional recipe..THANK YOU! First gluten free cookie the family liked! Thanks so much! We used a combination of muscavado sugar and coconut sugar and lowered it to 1 cup. Delicious! Wow. Just made these tonight and they are delicious!!! Thank you!!! These are awesome! I’m having a hard time not eating the whole batch at once. Even my non-gluten free, picky family like these which is REALLY saying a lot! My problem is I don’t want to share…. These cookies were amazing! Thank you for all the hard work that I am sure it took to create the perfect GF chocolate chip cookie. Thanks for the recipe! I had some quinoa flour to use and decided on cookies since my kids aren’t fond of the taste of quinoa.. I cut the sugar down to 3/4 cup (used mainly coconut sugar with a little white) and used half butter and half coconut oil. I also only used 1/2 cup chocolate chips because I used the mini enjoy life ones. They were a big hit with my kids. I made this cookie for my mil who is a celiac. It was my 1st attempt at a gluten free cookie. I was very worried about how it would come out, since I have never baked with most of the ingredients. I’m very happy to report that it turned out amazing! I followed the recipe to a T. I doubled the recipe and used unrefined coconut oil. I did sautee my quinoa flour as suggested (thank you for that!) I had googled how to bake with quinoa flour and was very worried when I read it is used by weight vs. by just measuring 2 cups worth. I finally just decided to measure 2 cups worth. It did work out and I’m so happy. But could you clairify this for me?? I will def. make this recipe again … for ourselves! The ingredients all work wonderfully together. The slight coconut flavor, the dark chocolate and the sea salt??? OH MY!!! Thank you soooo much! I’m so glad you enjoyed these! They’re one of my favorite gluten free cookies (and are the best for a reason!) 2 cups should be perfect in here. Which is your other fave gluten free cookie??!!! This one is also amazing! Thank you for the recipe! In my country, we have a lot of “organic” panela, or raw cane sugar, and they turned out quite good. They are a bit brownier than your picture, but they taste great. Thanks again! Just came across this while looking for something nice to make a friend with intolerances similar to celiac. I substituted 3/4 c butter per the discussion feed. These were amazing! To me they tasted so close to the real deal it was wonderful. In fact I think these turned out better than the ‘normal’ batch I made minutes before. Thank you for the great recipe! Look forward to discovering your other ones too. So happy to hear that! Hope you find some others you love here too 🙂 Happy baking! Do you measure the coconut oil before or after melting? I like the use of quinoa flour and the sprinkle of sea salt! Sweet and salty heaven! Ooh, I have never used quinoa flour in a recipe before! I might have tried it in gluten free vegan cookie dough, but I’m not entirely sure. 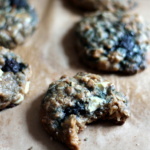 I bet it has a really lovely flavor and texture–your cookies turned out amazingly! YES it makes the cookie texture amazing! These look so good Monique! I love how simple the ingredients are too. Will be trying these and your bran muffins today, can’t wait! If you use butter instead of the coconut oil, would you still melt it? or just soften it like traditional recipes? I made these yesterday. They were exactly as you described. Texture was wonderful. Crispy on the outside and soft on the inside. Will make again! Thank you for creating these great GF recipes! Hi, is it possible to get the original recipe for these? I really should have it memorized I made it so many times! 🙂 I did try these, however, preferred the original. Thank you in advance. The only thing that’s different, is that this recipe is halved and includes one egg. If you double this recipe and include only 1 egg and 1 egg yolk, it’s the original recipe. In my opinion, this recipe has better texture! Is it possible to get the original recipe? I made them several times, I really should have it memorized. I tried these, however, prefer the original. Thanks! We too! What was the original recipe? I know I remember toasting the flour. This is the original. The only difference was that I left out toasting the quinoa flour and added 2 eggs instead of 1 egg and 1 egg yolk. Hi , is it possible to get the original recipe still? I loved it! Hi! I would like to add oatmeal to these cookies? How would I go about that? Do I replace some of the flour or can I just add some in ? I would do 3/4 cup quinoa flour and 1/2 cup gluten free oats! I recently did a food sensitivity test and was shocked to find out I was pretty much intolerant to all of the foods I was eating. For the past two months, I have had the hardest time finding something sweet that I could eat- until now! THANK GOODNESS FOR THESE COOKIES!!!! They were so easy to make and so delicious! It was my first time baking something from scratch and I didn’t mess it up! I have an egg intolerance and substituted the egg for 1/4 cup of unsweetened applesauce which tasted super delicious. I’m so glad you found these!! Best treat 🙂 Enjoy! Although I did not toast the quinoa flour, I didn’t taste the quinoa at all! Gosh these are good. I’ll be making these again. Perfect! So happy to hear that! Just made these. Made a few changes, 1cup brown sugar, 1/3 cup coconut sugar also I used a vegan butter substitute instead of coconut oil. These cookies are amazing! Thank you!! Perfect! Glad those swaps worked out. Doesn’t sea salt make everything better! I love baking with it. It really does! A little sprinkle on top is the best. Like it but to sugar for my taste. If I reduce the sugar should I increase other ingredient? If you reduce the sugar, the cookies may come out dry! I would maybe just decrease the flour a bit, not too much though! I made these and they are delishous! Even the kids loved them!! Thank you for sharing this recipe! I must try these! My kids would LOVE them! I want to start by saying how much I love your recipes. I just made this one and although it tastes great I found the dough a bit hard, making it hard to incoporate the chocolate chips. I follow the recipe almost as is, I ran out of coconut sugar so I used a cup coconut sugar with 1/3 cup raw cane sugar and I realized I forgot to add the 2nd egg, would this have made the dough less hard? I want to make it again i just want to know how to soften the dough incase it does happen again. Hi Stephanie! The egg adds moisture and liquid so yes, it will make a HUGE difference. Just made these. They are the most beautiful and greatest tasting non-flour cookies I have ever made! My hubby loves them too! I’m a Chicago native and was happy to see you live there!